Definitely a step up from the other last two posts when it comes to image quality, albeit thanks to a bit of luck and a helpful volunteer. Unlike those other two posts this one wasn’t taken in this month. Think I might have been spoiling my readers with such fresh content. Rather than put you back on the standard multi-year backlog, opted to only go back to last December. Appropriate in the sense that we were on the Gulf of Texas and like now, unseasonably cold and damp. If I remember correctly it was in the low 40’s and I was once again bundled up … IN SOUTH TEXAS! Granted back home was experiencing -20 before windchill. We left there and drove all the way to Texas to get away from it and get into some shorts weather before starting the new year. In between rains, we managed to make it back to Laguna Atascosa National Wildlife Refuge. If you enjoy wildlife photography and you haven’t been there yet stop reading this immediately and write it on your to-do list… really, go right now and write it down, I’ll wait (just be sure and come back or I’ll miss Raven’s next run and he doesn’t like it when Dad isn’t there to cheer him on). Tick tock, tick tock, tick tock – welcome back. You can search for Atascosa using the search bar if you want to see all the +1’s that have come out of there already. After spending the first half of the day wandering around the trails near the visitor center (where we discovered the Pauraque link here). We headed out to the lagoon overlook down where we discovered the huge mother Alligator and her offspring enjoying a mud puddle last year (link here). Upon our arrival at the overlook, we spotted the volunteer that was gracious enough to show us where the Pauraque was. He was sitting on the wall talking to his wife who was also volunteering at the refuge. We had started a discussion on how dry it had been down there (indicative by the distance from the shoreline to the start of the water and by the fact the mud puddle was all dried up and the Alligators nowhere to be found). 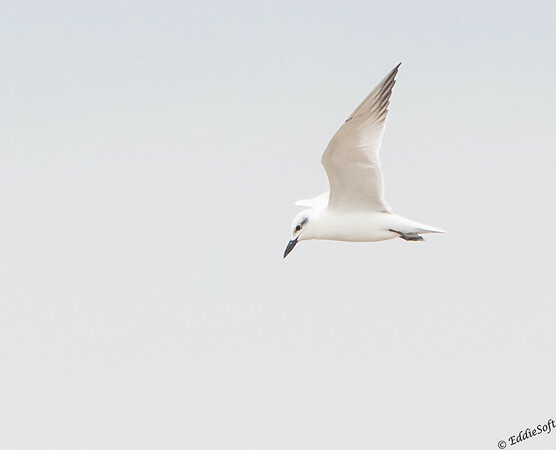 Mid response, the volunteer looked out and state “There’s a Gull-Billed Tern” and then started right back where he left off on the drought. I blinked a couple of times to make sure I was still in reality and then with probably too much excitement cut in with “Uhhh What!?!”. “A Gull-Blll..” – all I needed, the Beast was raised, brought on target, quick manipulation of the manual controls guessing on the exposure and 4 pictures snapped in the length of time it took to get from one side of the observation area to gone. I’m saving the first picture for my future talk on Polar Bears shot in a blizzard series – which is almost as popular as my world famous Pumas shot at Midnight presentation. I’d put them on my blog but do not want anyone taking them and trying to claim those masterpieces as their own. If that volunteer had not said anything or if we had been a minute or two later there would still be an empty box on the list in front of this Tern. And since it is a new bird, you deserve some additional cool facts to add to your knowledge bank. 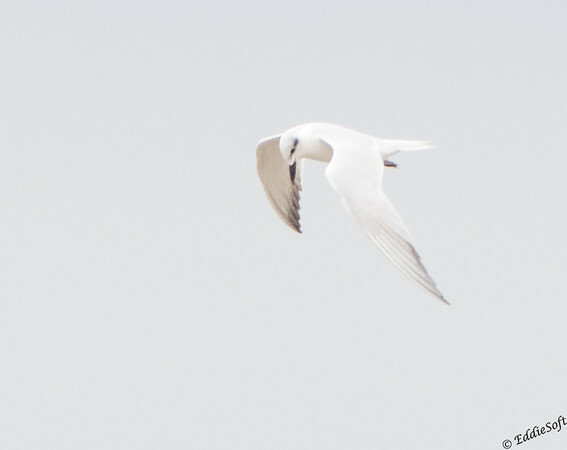 I do not even need to do any research for the first fact – this Tern got its name from the thick blunt bill that resembles a Gull more than the straight and sharper dagger sported by the other Terns. 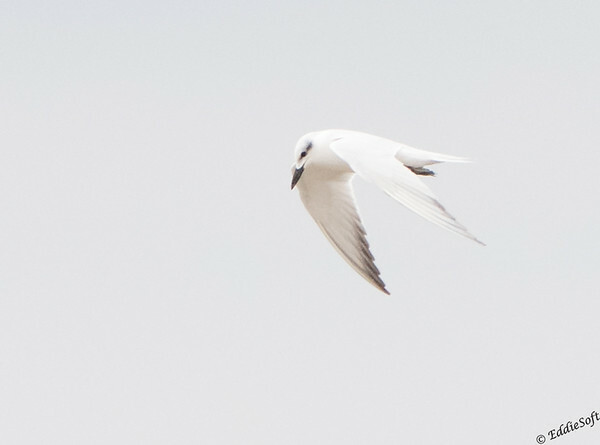 This Tern also hangs out primarily on the southern coastline. Unfortunately, the only other interesting fact I could find is unlike the other Terns, this one doesn’t just depend on a fish diet. Instead, it has a broader palette that includes insects and crabs it can find as it forages in the sky and on the ground. Looks like Raven is going into the ring again so better wrap this up. Hope you enjoyed this new bird – if nothing else, definitely better pictures to look at! Hope Raven did better later in the day. Cool tern. I can see why it could be lost from view in a snowstorm! Hopefully this is the last time any of us this Spring will have to mention the following: Snowstorm, windchill, – , ice, the best for last blizzard! May warm breezes bring Spring your way soon. Raven eventually pulled through on the last run of the day – got his new title and ended up being the only dog in his height class so picked up a first place ribbon as well! Unfortunately, it has now gone to his head and he’s prancing around his brothers showing off his latest spoils – it really isn’t a pretty sight ha. I had to laugh coming home from work today as it started to flurry. Mr. Winter is just playing with us now ha! Thanks for stopping by. So you name your dog after a smart, sassy bird and you’re surprised when he decides he’s going to run the show?? Nice pictures, and taken under emergency timing conditions! This bird has the look of an intelligent species, which I guess explains the laughing, after all. So let’s be clear here – Raven was NOT the name I originally gave Raven. In fact, the name I gave him (that Linda partially rejected) is actually in the part of the full name that rarely gets used beyond being printed on his official certificates. his name to me will always be Anubis which goes nicely with his brother Osiris (Rizzi). For the curious, his name is Anubis Nevermore Now Raven which is apparently too much to use in the show ring. I flat out disagree with that – but I ended up losing that argument because I’m not the one who has to call him in the ring. My answer was to call him Noob, but again DENIED. So what do you think about this ID – I’ve been wondering about this ID for awhile now and still can’t seem to tamper my doubts. Granted I put a lot of weight on an expert directly telling me what it is (especially if I have never seen one before), but that bill just seems to be slightly off.